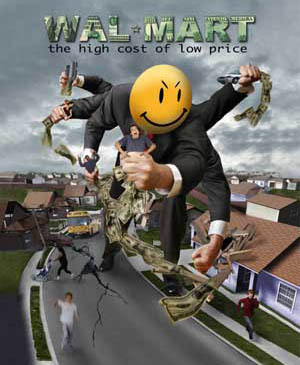 Walmart has become an icon of the corporate rush to keep costs low and profits high, regardless of the effects on society. They sell cheaply made goods—often produced in deplorable conditions—for low prices and keep overhead costs low by refusing to pay their workers a livable wage. It is this business strategy that catapulted them to be among the largest corporate interests in the world and allowed them to spread into virtually every corner of the United States. Currently, approximately 25% of the American grocery market is controlled by Walmart, making it the largest single grocery distributor in the United States. In some areas—including many rural and low-income urban locales—this control is far larger than 25%, as the low prices of Walmart have crowded out competition and created a local monopoly. As Walmart is so much larger than its competitors (ex. farmer’s markets), it is able to undercut the prices of their competition and squeeze them out of business. The business model and sheer size of Walmart have caused their corporate practices to have huge impact on the global agricultural markets—they are so large that their choices lead to ripples in global agriculture markets. The Walmartization of food sale has promoted the sale of cheap, processed, foods over that of the more expensive fresh produce and unprocessed foods. In addition to this, the massive need for cheap agricultural products has led to an increase in the prevalence of industrial “mono-crop” farms. It is far easier and less expensive for food sellers to stock junk food and highly-processed, long-lasting foods than it is for them to stock fresh produce. Unlike produce, chips, pre-prepared meals, and many other processed foods do not spoil and require minimal labor to manage in a store—there is less of a need to have people spend time checking the freshness of the goods and less waste due to spoilage. To see this effect in action, you can simply go down to your local 7/11, Store 24, or Tedeschi’s and compare the prevalence of fresh products to non-perishable processed products. In many poorer areas of the country, “food deserts” have formed and people simply lack access to a supplier who sells healthy foods. A food desert is simply an area where poverty has driven out sellers of fresh, organic, and un-processed foods, leading to a situation where the only available foods are cheap, processed, pre-packaged, and unhealthy foods. Walmart is large enough that these food deserts are a great place to set up shop (they can crowd out the already weak competition), and the company has already made attempts to move into existing food deserts. According to a recent study by the City of Manhattan, this encroachment into food deserts by Walmart will result in the destruction of most local food businesses (including those few which sell healthy food), and will not have any appreciable positive effect. Within a few years, the only “fresh” produce available in these places will come from the Walmart that took over the area’s grocery market. If Walmart were to supply healthy, fresh and clean produce, their encroachment and takeover of food deserts would be a purely economic problem, but this is not the case. In recent years, Walmart has attempted to brand itself as a reliable supplier of not only snack food, but fresh produce. Unfortunately for them, this attempt has been marred by numerous situations that demonstrate that Walmart’s “fresh” produce is often of low quality and not really fresh. In fact, Walmart has a very bad history in regard to produce freshness and GMO labeling. As reported by the news agency RT.com, Walmart is now selling Monsanto GMO produce, without warning labels, in their produce departments. Of particular note, Walmarts across the country are now selling Monsanto’s GMO corn on their shelves, while giving the consumer no warning whatsoever. While Walmart claims to sell locally-sourced, organic foods, several scandals have questioned this claim. In a recent scandal in China, Walmarts were shut down for fraudulently selling port that was not organic, under the label that is was organic. Regardless of whether or not Walmart “organic” food is actually organic, Walmart gets most of its “organic” produce from suppliers in China and industrial farms—this means that regardless of which “organic food” a consumer may buy from Walmart, it is not likely to have come from a small, local farm. The massive demand for food by our planet’s population and the proliferation of processed foods in the Walmartization of agriculture, has led to an increase in industrial mono-crop farming, particularly in regard to corn. 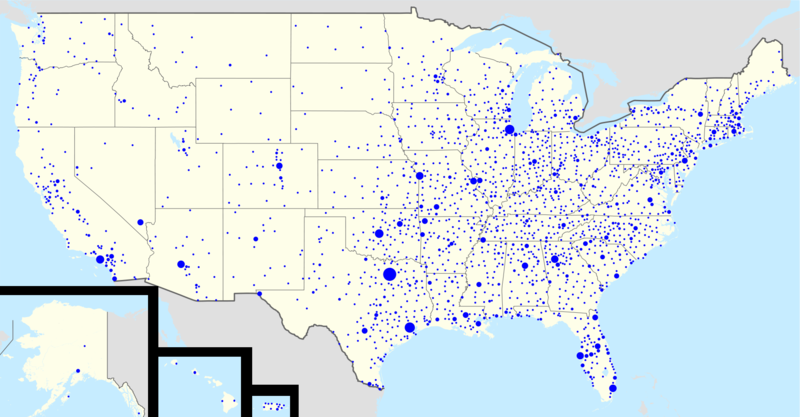 Small farms are simply unable to produce the volume of produce that is sold by Walmart, so it is larger industrial farms which get Walmart’s business. Monocrop farming may claim to be more efficient at growing food, but this is simply not borne out by the evidence; such farms are not sustainable and often utilize extremely powerful pesticides in order to control pests. 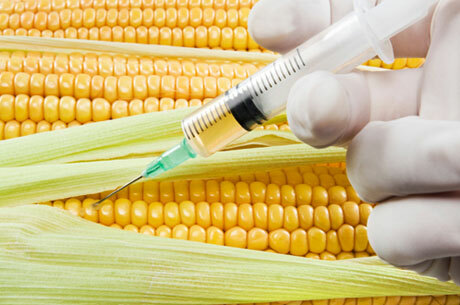 The industrial mono-crop farming of corn is a very important part of this situation, as much of the world sweet-corn farming is used in the creation of high fructose corn syrup for processed foods. Virtually every processed food contains some amount of high fructose corn syrup, thus huge amounts of corn need to be grown. To make matters worse, American corn that is intended for high fructose corn syrup is commonly made out of GMO corn—oftentimes Monsanto “Roundup Ready” corn. In totality, the proliferation of Walmart as a primary grocery source and the Walmartization of the American food supply is undeniably a consequential phenomenon. Some claim that this will result in cheaper food for the poor, but many others are worried that food will decrease in quality and this will eventually lead to serious health consequences. In our current hard economic times, an increasing number of people are forced to turn to Walmart as a source of cheap food (or are forced to as smaller stores go under). Because of this, the business practices of Walmart are very relevant to the health of the food supply of the United States. We must ask ourselves, do we want to create a situation where agriculture and food supplies conform to the cheap, low-quality products business model of Walmart?